News Photo by Jonny Zawacki The Onaway volleyball team poses after winning a Division 4 regional championship on Thursday in Mackinaw City. Members of the team include, from left to right, back: Breya Domke, Cloe Ehrke, Nicole Larson, Malaisha Van, Lexus Horton, Karli Tulgestke, Jackie Sellke and head coach Steve Watson; middle: Mattey Hoerner, Mallorie Neelis, Jordan Larson, Malaurie McLean and Taylor Larson; front: Calley Selke, Sunny Flory and Kennedy Crawford. MACKINAW CITY–Throughout the postseason, neither the Onaway or Rudyard volleyball teams have been challenged much. 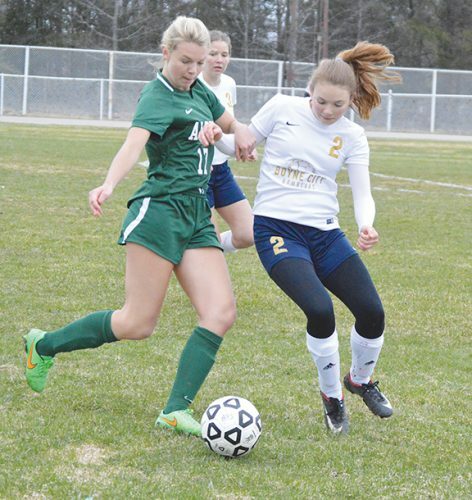 That all changed on Thursday when the two teams clashed for a Division 4 regional championship in Mackinaw City. 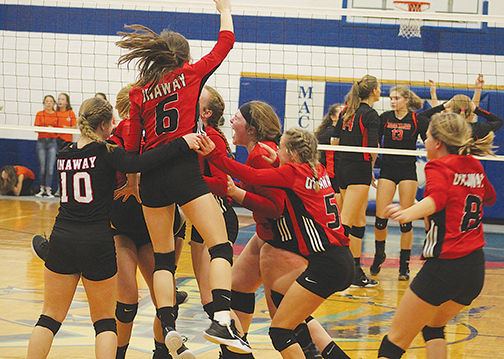 The match exceeded expectations and in the end it was Onaway who erased a 7-3 deficit in the fifth and final set and stormed back to capture its first regional title since 2014 with a sensational victory over Rudyard: 14-25, 25-23, 25-19, 18-25 and 15-13. 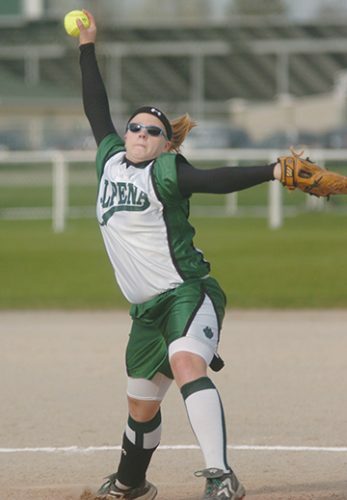 Onaway advances to a quarterfinal matchup against Carney-Nadeau on Tuesday at a location to be named later. News Photo by Jonny Zawacki Members of the Onaway volleyball team celebrate after scoring the game-winning point in the fifth and final set. The Cardinals trailed Rudyard 7-3 in the fifth set when Watson called a timeout to try and let his team regroup. Onaway answered the call and scored three of the next four points to cut the lead to two before scoring five unanswered to take an 11-10 lead behind strong serving from Malaurie McLean who finished with 14 digs, four kills, four aces and two blocks. The Bulldogs used a timeout and also responded by scoring three of the next four points to take a 13-12 lead. Watson called one final timeout and the Cardinals finished the game in thrilling fashion, scoring the final three points after long rallies and a ruckus Onaway crowd witnessed a ball sail out of bounds to give the Cardinals their 15th point and a regional championship. 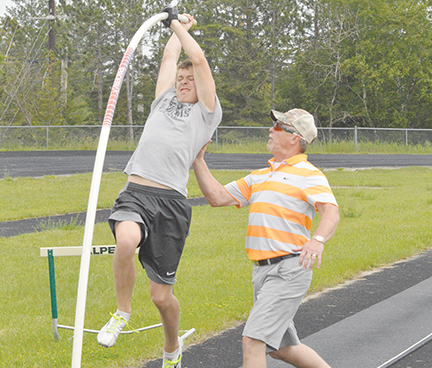 It took some time for the Cardinals to adjust to Rudyard’s height around the net. The Bulldogs closed the first set strong with their ability to attack at the net as the length of Rachel Beelen and Sydnie Zeeryp posed a huge threat to the Cardinals early. Onaway made adjustments and did all it could to eliminate and limit Rudyard’s chances around the net as it battled to win a tight, back-and-forth second set and grabbed a lead in the match by winning the third set when Breya Domke finished the third set with three straight aces. 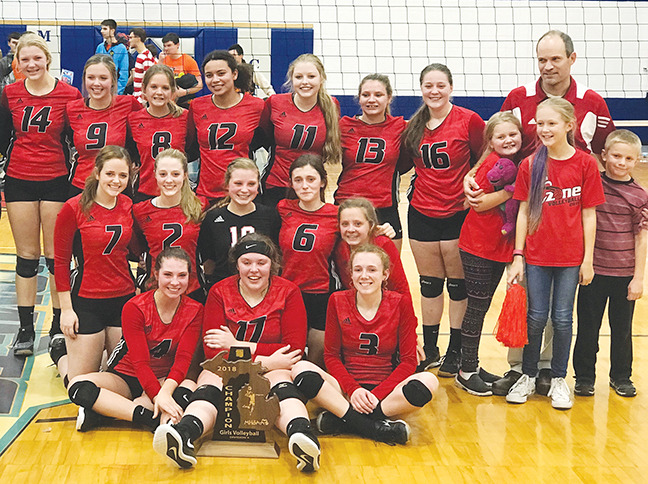 After taking a 2-1 lead in the match, Rudyard showed why it came in ranked tenth in Division 4 as the Bulldogs controlled much of the fourth set and won to fittingly send the match to a fifth and final deciding set. Domke ended the night with 12 kills and five aces. Mallorie Neelis dished out 27 assists to go with 10 digs, six kills and three aces. Calley Selke recorded 15 digs, 13 kills and three aces. Kennedy Crawford had nine digs, six kills and five aces and Jordan Larson added 18 digs.